This essay was published in The Book Club of California Quarterly, Winter 2019. While touring Europe in 1878 and 1879, Mark Twain filled many notebooks for use in a travelogue. Although much of what he wrote during the sixteen-month trip was never published, such as his comparisons of European and American homes and transportation, a list of his favorite foods made it into the final manuscript of A Tramp Abroad (1880). Having grown weary of the “monotonous variety of unstriking dishes” in European hotels, Twain declared: “It has now been many months, at the present writing, since I have had a nourishing meal, but I shall soon have one—a modest, private affair, all to myself. 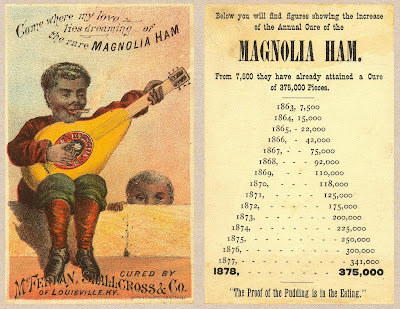 I have selected a few dishes, and made out a little bill of fare, which will go home in the steamer that precedes me, and be hot when I arrive…”1 Miraculously, Twain's iconic list of eighty American foods somehow defined a national cuisine. In his new book Twain’s Feast: Searching for America’s Lost Foods in the Footsteps of Samuel Clemens, slow food advocate Andrew Beahrs uses Twain’s imaginary menu as a jumping off point to track down eight of the foods, and thereby draw our attention to some of the wild species that have all but vanished from American tables. For Beahrs, the menu represents an ideal: “Fresh. Local. Intimately tied to place.” And while it’s true that Twain experienced many of his favorite foods in their places of origin, it would be a mistake to cast him as a “proto-locavore,” espousing a philosophy of locally grown foods. Rather, Twain was a man of his generation—one of the first generations whose diet was not subject to strict geographical constraints. He clearly embraced this new freedom. Celebrating America’s expansive natural bounty, Twain developed his list of foods to challenge the prevailing idea that everything was better in Europe. (It was the same theme that characterized his unpublished critique of European homes and transport —“With them it is all gilding and massiveness and state…”2) Twain was proud of American cuisine, seeing it as a reflection of the nation’s straightforward character. One way to think about Twain’s bill of fare, and what it revealed about his country’s unpretentious, technology-driven culture, is to compare it to an actual menu of the period. First, let's look at Twain’s “little bill of fare” as it appeared in A Tramp Abroad. “Radishes. Baked apples with cream. Oysters roasted in shell—Northern style. Brook trout, from Sierra Nevada. 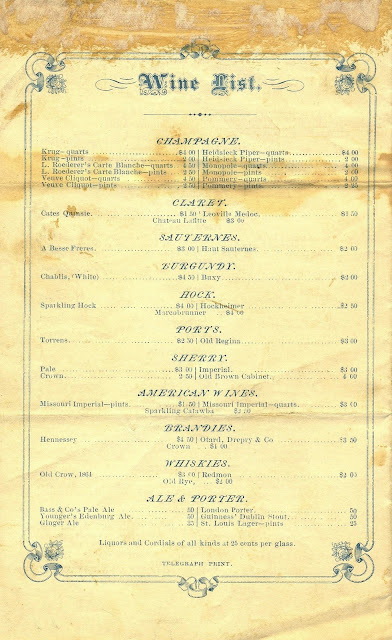 The menu below comes from the Arlington Hotel in Hot Springs, Arkansas. This resort was located about 700 miles southwest of Chicago, not far from the part of neighboring Missouri where Twain grew up. 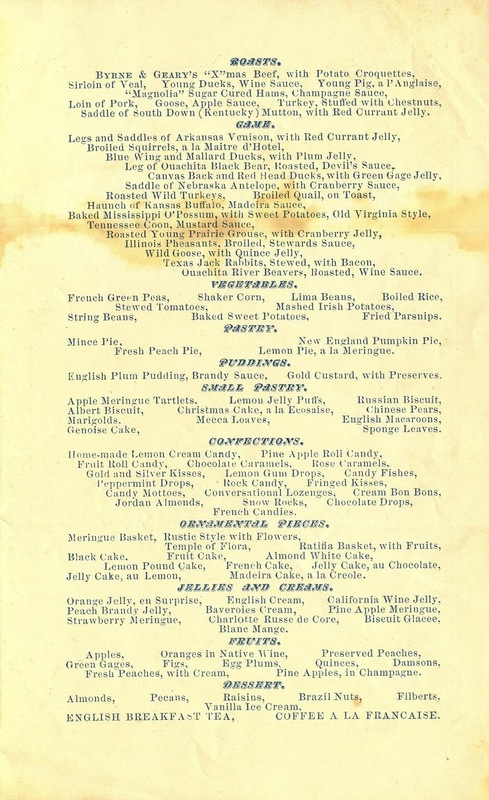 For its Christmas dinner in 1875, the new 120-room hotel pulled out all the stops, serving a large number of special dishes.3 In fact, its remote location may have prompted the steward to note the points of origin for many of the foods that he was able to procure, giving this bill of fare a striking resemblance to Twain’s ideal meal. The cities and states of origin on the Arlington menu are highlighted in bold type below. Considering that this menu was created for a real dinner, it is surprising how similar it is to Twain’s imaginary list. 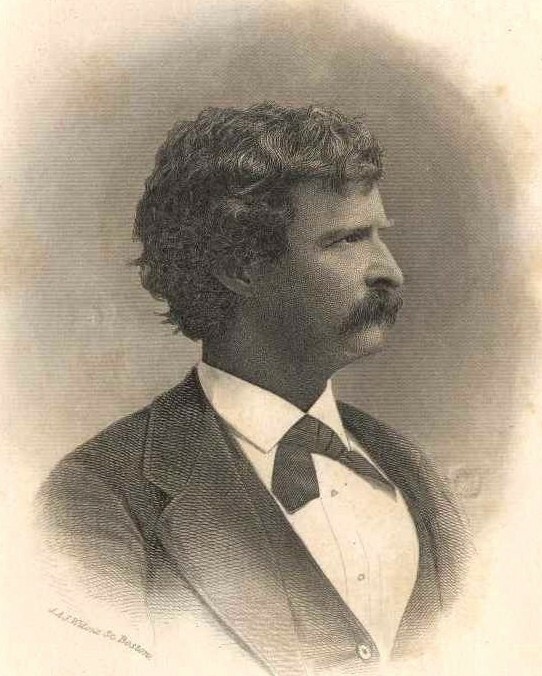 After all, Twain had utter literary license, free to include breakfast and dinner dishes, and was not constrained by what could be obtained on a given day or season. Green sea turtle soup. Oyster soup. Mackinaw trout, baked, wine sauce. Round of St. Louis spiced beef. Byrne & Geary’s “X”mas beef. mutton, with red currant jelly. Squirrels, broiled, a la maitre ďhotel. with sweet potatoes, Old Virginia style. Wild goose, with quince jelly. Texas jack rabbits, stewed, with bacon. Mince pie. Fresh peach pie. Green gages. Egg plums. Damsons. The presence of beaver and black bear from the Ouachita River watershed, and venison from Arkansas, reflected local pride. 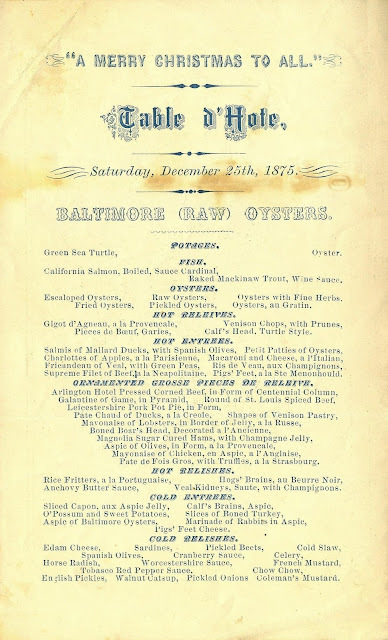 On the other hand, there was also an appreciation of being able to transport food over long distances by rail.5, 6 This is immediately evident by the large, artistic type that boasts “Baltimore (Raw) Oysters.” This special menu includes many game dishes, such as Kansas buffalo, Nebraska antelope, and Texas jack rabbits, and perishable fish like California salmon and Mackinaw trout. Being able to procure a wide variety of foods in Arkansas was a new thing. When railroads began operations in the 1840s, they profoundly affected people's sense of time and space. Initially, the change in personal mobility was startling, but as the rail network expanded after the Civil War, it was the vast increase in freight traffic which changed perceptions.7 By the 1870s, refrigerated cars began to impact food distribution, dramatically increasing the number of items that could be shown on a menu in an isolated rural location. 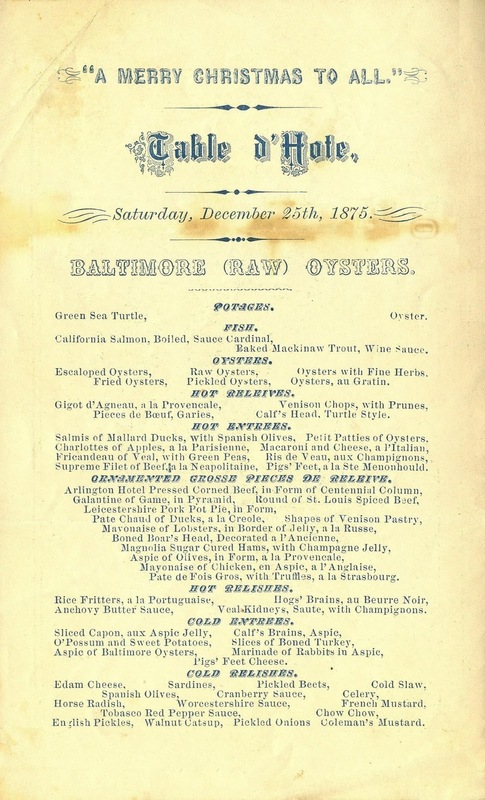 It must have been exhilarating when fresh oysters suddenly appeared on menus throughout the country during this period. Processed foods were also being more broadly distributed—Tobasco (sic) Red Pepper Sauce makes an early appearance on this menu. There are also some big differences between these two menus. Twain used simple language like “Northern Style,” and more often “Southern Style,” to describe his most elaborate preparations. 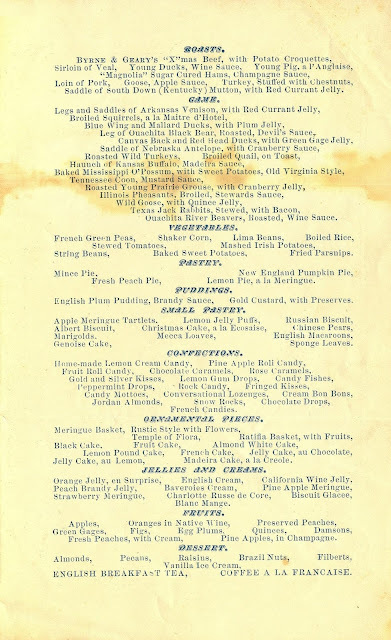 He also desired “all sorts of American pastries.” By contrast, the Arlington offers an international assortment—Genoise cake, Russian biscuits, Chinese pears, Mecca loaves, and English macaroons. Indeed, English food was then the primary basis of restaurant and hotel fare in the United States, as reflected by the Leicestershire pork pot pie and English plum pudding. There are no English dishes on Twain’s menu. The absence of French on Twain's bill of fare is also revealing. French was used extensively on the menus of luxury establishments in the nineteenth century. The Arlington Hotel served dishes with names like pate de foie gros (sic) à la Strasbourg and gigot d’agneau à la Provencale. Some of the English dishes are described in a mixture of English and French terms, such as mayonaise of chicken à la Anglaise. The English and French influences are neatly summarized at the bottom by the English breakfast tea and coffee à la Francaise. By contrast, Twain serves the quintessential American beverage—ice water from “the sincere and capable refrigerator,” a new technology that also reflected national attributes. 1. 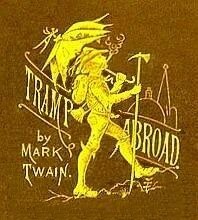 Mark Twain, A Tramp Abroad, New York (1880). 3. 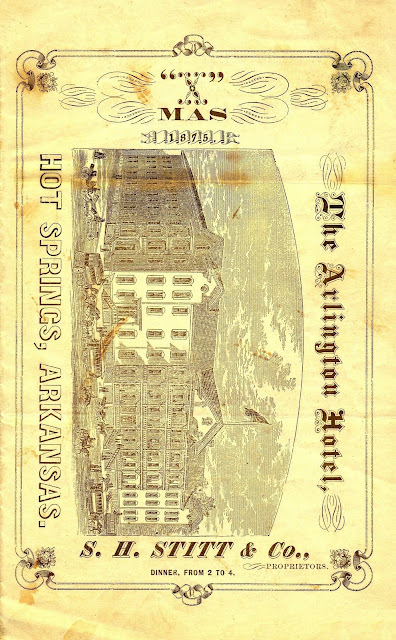 Already the largest hotel in the state, the Arlington added 100 rooms in 1880. The building was torn down in 1893 to make way for a 300-room Spanish Renaissance hotel which burned down in 1923. It was replaced with the 560-room hotel still in operation. 4. Lima beans, a food of Andean and Mesoamerican origin, were one of foods that Twain dropped from the original list in his notebook. 5. The Ouachita River runs 605 miles south and east through Arkansas and Louisiana, joining the Red River just before it enters the Mississippi River. 7. After the completion of the transcontinental railroad in 1869, the mileage of track in operation in the U.S. exploded from about 53,000 miles in 1870 to over 163,000 miles in 1890. By that time, goods were being shipped directly to rural households from newly-established mail order houses, such as Sears, Roebuck, and Co. in Chicago, which published its first mail order catalog in 1888. The railroads peaked in 1916 with 254,000 miles of track. 8. Andrew Beahrs, Twain’s Feast: Searching for America’s Lost Foods in the Footsteps of Samuel Clemens, New York (2010). Great and thoughtful post... fascinating stuff. When foreigners came here they were in awe of the variety... but not so much the presentation. Twain, ever wise, knew this to be true. Of course the missionary line is pure Twain humor! I learned so much from reading--and writing down for my own record--Twain's list. It recalled for me several of the State Dinner menus created for Rutherford B. Hays when he was US President. It helped me make interesting connections between Frederick Douglass Opie's _Hog and Hominy: Soul Food From Africa to America_ that I am currently reading. Igbo and Mande Africans fried chicken and guinea hens in palm oil to celebrate special occassions. When they arrived as slaves in the Carolinas and elsewhere in the South, they immediately continued the practice, albeit with lard. I am now inspired to determine what Twain means by "southern style" for all those various breads he listed, as well as some of the other foods. Thanks! !